Fiction – Kindle edition; Harper Collins; 400 pages; 2019. Review copy courtesy of the publisher via NetGalley. Christian White’s The Nowhere Child is the latest in that new wave of Australian crime writing that is attracting an international audience. Like Jane Harper’s The Dry, it, too, has won a Victorian Premier Literary Award and, fresh on the heels of its Australian publication success, will be published in the UK next month. But there’s an important difference here: this book, to me, does not feel particularly Australian. Only a fraction of it is set Down Under (in suburban Melbourne); the bulk of it is set in Kentucky, USA. For that reason The Nowhere Child feels too generic to be classified as “Southern Cross Crime”, though I’m sure that won’t stop the publishers from marketing it as such. That said, it’s a fast-paced read (as you would expect for a psychological thriller) and has an intriguing premise: Kim Leamy, a young Australian photographer, is approached by a man, who claims she’s really Sammy Went, a toddler abducted from the USA 20 years earlier. This news, greeted at first with disdain and disbelief, turns Kim’s life upside down. If she’s really Sammy Went, how did she get to Australia? Was her late mother responsible? Has her entire life been based on a lie? To flesh out how Sammy went missing, along with the long-term repercussions of that event and the family secrets that lead up to it, the novel is split into three narrative threads — Melbourne, now; Kentucky, now; and Kentucky, then — which are told in alternate chapters. This builds up the suspense element of the story and lends it a page-turning quality. The characterisation is good, particularly Kim, whose confusion and distress seems to resonate off the page, but the American cast — the closet homosexual, the alcoholic “white trash” woman living in a trailer, the pious leader of a kooky religious sect et al — felt slightly clichéd to me. Like Phoebe Locke’s The Tall Man (which I reviewed yesterday), The Nowhere Child is right out of the Stephen King playbook as well. (There are even minor references to “a tall man made entirely of shadows” that Kim dreams about!) That’s not to say the book is bad; it’s simply not particularly original. Its expertly paced, deftly plotted and has a (rare for the genre) satisfying conclusion. 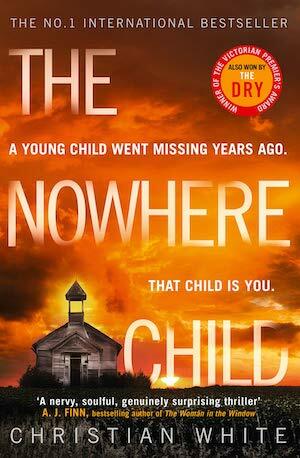 An entertaining story, The Nowhere Child is sure to be lapped up by millions of readers across the world. It will be published in the UK on 21 March, but can be downloaded on Kindle now.